Synopsis: An imprisoned vampire, Barnabas Collins, is set free and returns to his ancestral home, where his dysfunctional descendants are in need of his protection. Review: Raise your hand if you are tired of the continued collaboration of director Burton and star Depp. Ok, now raise your other hand if you are also exhausted with Burton including his wife Bonham-Carter in his movies come hell or high water. Now that all of our hands are up do the hokey pokey and shake it all about because you probably aren’t the ideal audience for this film…and that’s what it’s all about. In all fairness, the film adaptation of gothic 70’s soap opera Dark Shadows isn’t a total miss. It’s actually better than you think it’s going to be if you plunk your cash down with the understanding that the movie still has a small screen feeling at heart. Yes, the sets, costumes and performances are larger than life but it is, at heart, an adaptation of a soap opera. Go into it thinking otherwise and you are bound to be let down. I found it to be a mostly enjoyable and well designed romp that sees a welcome return to form for its director. Lately, I’ve lamented the fact that Burton has been relying more and more on green screen to create his environments rather than spend the money to create the extravagant sets of his earlier work. Imaginative designs in Beetlejuice, Edward Scissorhands, and Batman (to name just a few) gave way to largely CGI worlds of Sweeney Todd and the dreadful Alice in Wonderland. While not totally back to the “old school” ways there are more than enough impressive set pieces to help you remember why Burton was hailed as such an innovator of his time. Perhaps what is on display here is Burton testing the waters again for that kind of large scale design that he shoots so well. With every Burton movie one must ask: “And what is Johnny Depp playing?” Here, Depp dons the fangs of Barnabas Collins who rises from the undead to find himself in a world he is unfamiliar with. You see, centuries ago he was cursed by a witch and buried only to be unearthed by a back hoe building a chain restaurant (one of the many clever sight gags the picture employs). His arrival at his family estate and subsequent reentry into 1972 society is pretty much all you need to know about the plot. I’m not going to be one of those lazy reviewers that spends 2/3 of my review detailing every nook and cranny of plot so you’ll have to see the movie to discover a few more wrinkles to the script written by Seth Graheme-Smith (who also wrote Abraham Lincoln: Vampire Hunter, the Burton-produced movie version of which comes out later this summer). Adding support to (and stealing the show from) Depp are two ladies that are a welcome presence onscreen. First up is Pfeiffer, reuniting with Burton after creating the definitive Catwoman in Batman Returns (sorry Anne Hathaway…you’re not even close). Looking regal and perfectly cast as the matriarch of the Collins clan, Pfeiffer delivers the material with just the right amount of cheekiness so that we know she means what she says…but also knows what kind of movie she’s in. Costumer Colleen Atwood decks her out in grand costumes fit for a respectable disco queen and Burton films her with style. Villainess Green is the one to watch here as she gleefully goes toe-to-toe (or, toothy grin to fangy scowl, as it were) with Depp. Motivated by a deep obsession with Barnabas, she plays infatuated in the same vein as scorned woman…so you’re never quite sure what she’ll do next. She mostly hides her French accent though her struggle to stay in the American creates a nice weirdness that works with the overall effect. I especially liked as sthe cracks show in her façade (literally) as the finale nears. On the tech side, the aforementioned costumes from Atwood are near perfection as usual as is the production design by Rick Heinrichs. The score by Danny Elfman has some classic Elfman touches but it’s nice to hear him going beyond his usual fare and focusing on a more robust orchestral sound. The soundtrack is filled with some carefully selected classic 70’s tracks…it’s not Tarantino-clever choices but they all fit with the feel of the picture. Now to the bad, or bland shadows of the film. Bonham-Carter appears here in a fat suit (at least I hope it was a fat suit), a orange wig from the Carrot Top chic collection, my mom’s sunglasses, and an accent (and character) without purpose. She’s so shoe horned into the picture and her arc so pointless that it appears Burton just asked her to show up and improv her part. It’s not all her fault…but let her shoulder the blame because she does her fair share of unnecessary scene hogging. A secondary storyline, that is all but abandoned involves Heathcoate as a “woman with a secret” that shows up at Collinwood Manor just about the time Barnabas returns. Moretz has a few nice moments but her line delivery gets old real fast. All three of these plotlines are extraneous but if you come at it from the soap opera “serial” nature they may be excused more easily. 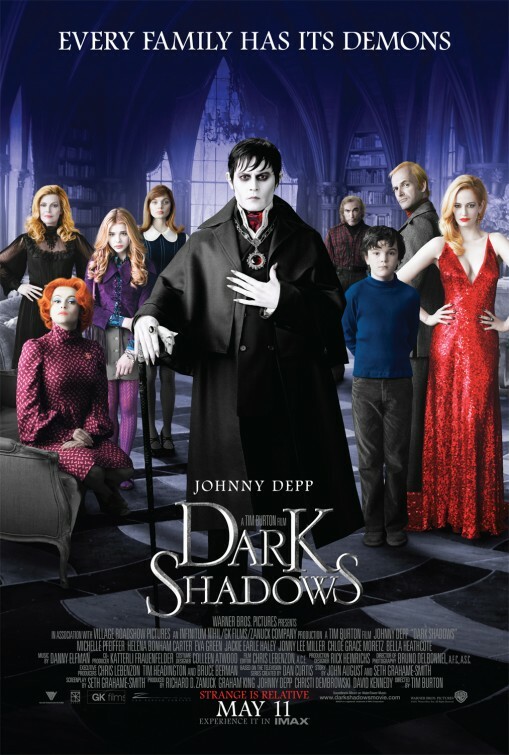 Most will look at Dark Shadows as a failure but I found it to be a nice entry in the Depp/Burton canon. It’s leagues better than Alice in Wonderland and was more interesting visually than Sweeney Todd. I’m not sure summer was the right time to release it, it may have gone down easier with a late summer or early fall bow. The chill in the air would have made the movie a nice choice for a crisp fall day.